Beneath the turquoise colored water of Big Tub Harbour in Fathom Five National Marine Park in Ontario, Canada, the shipwreck of the schooner Sweepstakes lays to rest. Originally being shipwrecked off Cove Island in 1885, the Sweepstakes was towed into Big Tub Harbour where it sank to the depths below and has now become a popular tourist attraction. People come to Big Tub Harbour to scuba dive around the ship while others board a tour boat for a closer look. During the year when Lake Huron is low, the shipwreck is visible from above the surface and many walk the beach of Big Tub Harbour and admire the shipwreck from afar. The Sweepstakes is 1 of about 20 shipwrecks found in the coastal waters of Fathom Five National Marine Park as Lake Huron was underestimated during the 1850's at the onset of the shipping industry, causing serious damage to many. Picture of a shipwreck, the Sweepstakes in Big Tub Harbour in Fathom Five National Marine Park, Ontario. 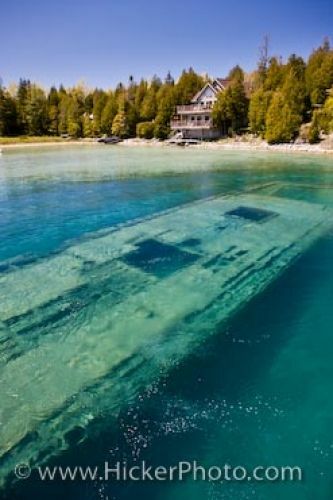 Shipwreck of the ship Sweepstakes (built in 1867) in Big Tub Harbour, Fathom Five National Marine Park, Lake Huron, Ontario, Canada.